Though busy with his campaigning, MILIND DEORA spent some time with NITHIN BELLE for an interview at his south Mumbai office. MANY Congress candidates are nervous about facing the electorate this time, fearing a backlash from voters. But one Congressman who is confident as he takes on a tough challenge in one of the most prestigious constituencies in the country — Mumbai south — is Milind Deora, the sitting MP and the minister of state with two important portfolios: communications and IT and shipping. 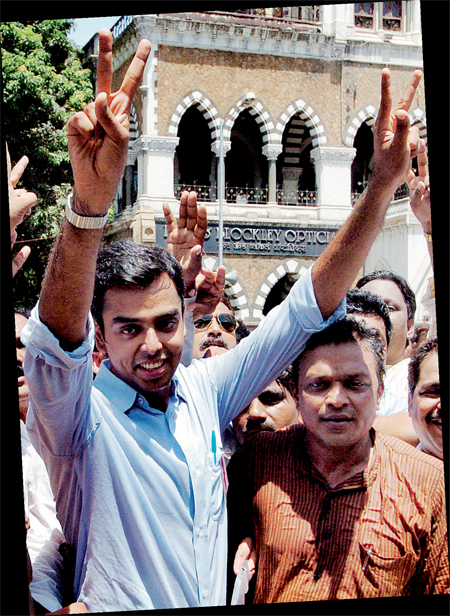 Son of senior Congress leader Murli Deora, Milind was one of the youngest MPs in India, when he won the 2004 elections from south Mumbai at the age of 27. He has a bachelor’s degree in business administration from Boston University, and is also an accomplished guitarist and blues musician, who has performed with several bands. Though busy with his campaigning, MILIND DEORA spent some time with NITHIN BELLE for an interview at his south Mumbai office. Excerpts. How are you gearing up for the battle ahead? Is it an uphill struggle? South Mumbai is a unique constituency and always attracts its fair share of serious and frivolous candidates. But I take every opponent of mine seriously. My campaign is going well so far and we are getting organised. I don’t think it would be fair to say that it is an uphill struggle. Every election has been tough and before the results, they appear to be very difficult and challenging. Both in 2004 and 2009, for instance, opinion polls had predicted I would lose in south Mumbai and the Congress would not form a government at the centre. They were proved wrong on both occasions. But I approach elections very carefully and do not take any candidate lightly. How are you approaching your voters this time? By door-to-door campaigning, or approaching them through social media or other media? We have different mediums for different voters. There are community leaders with whom we have worked for a long time. So we approach voters through them, through social media and through physical interactions. Different communities have different issues and expectations. We have a pretty good election machine comprising friends, well-wishers, contacts and a network of people who we work with throughout the term. Ultimately in politics, you cannot parachute once every five years and face your electorate. Such candidates never win elections. You have to be engaged with your voters, involved in their problems, fight for them and lend them a voice. How do you plan to counter the anti-corruption plank of the Aam Aadmi Party (AAP), especially Meera Sanyal, the AAP candidate in south Mumbai? I treat her candidacy with respect, just as I did in 2009, when she performed very poorly. Even now I treat her and her party with respect. The issue she will face is that in the last election she was committed to being around in the constituency regardless of whether she won or not. But for the last five years, she has been off the radar from this constituency. I have to also prioritise my opponents. Eighty per cent of my priorities are against my two main opponents, one from the Maharashtra Navnirman Sena (MNS) and the other from the Shiv Sena. The remaining would be on Meera and the other candidates. Are the two Sena candidates, Bala Nandgaonkar of the MNS and Arvind Sawant of the Shiv Sena, formidable opponents? Will the split among the Marathi votes help you this time as well? After the merger of south-central and south Mumbai parliamentary constituencies in 2008, both the Senas have emerged with a strong base in the new constituency. In the 2009 elections, the MNS did not have an MLA, but now they have a legislator (from among the six legislative constituencies). The sitting MLA (Nandgaonkar) is fighting against me. In 2009, I did not consider the split in votes as a part of my strategy. There are people who fight to split my votes. Splitters and frivolous candidates are part of the process. MNS is my most serious opponent this time. Do you see the Congress once again sweep the elections in Mumbai, despite the widespread anti-incumbency feeling against the party? Things are not as bad for us in Mumbai as people say. Opinion polls in both 2004 and 2009 proved to be wrong, both in my case in south Mumbai and for the UPA government at the centre. They had predicted I’d lose elections here and that the BJP-led NDA would come to power in Delhi. But the opposite happened. In 2004, I won the elections with a margin of 10,000 votes and the Congress came to power with 145 seats in Parliament. In 2009, I won by 112,000 votes and the Congress increased its tally to 200-plus. India is a very complex country and even a constituency like south Mumbai is very diverse. It is very arrogant to predict results. In 2009, the main issue in south Mumbai was the 2008 terrorist attacks in the city. Would you agree this time it is the corruption issue that is centre stage? It is mainly the local issues that affect voters. Different communities have different issues. People vote on both party issues and individual issues. Some may not like a specific party, others may not like the candidate. There are a plethora of issues. When I talk to the English media, they ask me questions about the AAP. But when you go to the masses, you know who your real threat and opponent is. Internally we know how to prioritise the threats and the challenges posed by our opponents. With both the Shiv Sena and the MNS backing Narendra Modi as the next prime minister of India, won’t it split the NDA vote share? I’m not even getting into that. Frankly, the way I look at it, in 2009 the MNS had broken from the Shiv Sena, but its candidate came second in south Mumbai. In the assembly elections that followed, the MNS also won a seat in this constituency. The dynamics have changed considerably. In 2009, I did not know how big the MNS was, but today I know, it is big. I know its candidate has a base here for the last five years. He is my primary opponent and the Shiv Sena candidate is my secondary opponent, everyone else is in the final category. What are the issues facing the electorate in south Mumbai? I tell my voters that my opponents are not working in your interest. They do not want you to learn English and get new opportunities. I’m not against Marathi, I’m all for the language; my mother is a Maharashtrian. But I want you to have the opportunity that I had, whereas my opponents do not want that to happen. Then I explain to them what I have done to give them those opportunities by organising job fairs, skills development initiatives. As an MP I made sure that Maharashtra was the first state to have a housing regulator in the country. I take their side, not of the builders. As the telecommunications minister, I have set some of the most stringent radiation norms for mobile towers and handsets, even though the owners of the largest telecom firms live in my constituency. I’ve always spoken for the people, not vested interests. One does not see the AAP effect in Mumbai as much as in Delhi. What are the reasons for this? Mumbai is a very different city; it is cosmopolitan and more economic-minded. That is why even parties like the Shiv Sena and the MNS do not get that much traction in Mumbai, as the citizens do not appreciate a bandh by the two Senas or a dharna by the AAP. The city welcomes parties who are broad-based and encourage trade and commerce and create job opportunities, not a division among communities. The unique thing I face with my three opponents is that all of them have a common theme, which is divisiveness. They talk of rich versus poor, Marathi versus non-Marathi, Muslims versus Hindus. Mumbai residents, whether they are Marathi-speaking, Jains, Hindus or Muslims, do not like such divisiveness. I am proud to represent rich billionaires, middle-class residents and even the poor. I know Cyrus Msitry, the Tatas, Kumar Mangalam Birla and the Ambanis. They are important constituents for me. But so too is Pradip Jaiswal, who runs a sandwich stall outside the Bombay Stock Exchange and lives in a slum. You are close to Rahul Gandhi. What are the chances of his leading the Congress to victory? The unique thing about Rahul Gandhi is that he does not have the arrogance that the other leaders have. In a complex country like India, to say that I have the solution to everything is a very arrogant position to take. Modi says he has a solution to every problem and Arvind Kejriwal claims he is clean and everyone else is corrupt. These are all arrogant positions to take and do not get you long-term support. As for the election results, let us wait till May 16.